When I found out for sure that I was going to my friend’s wedding in India, I knew I had to somehow make a trip to see the Taj Mahal. I had to figure out a way to get myself to Agra from Chennai where the wedding was to be held which is on the south-east coast. 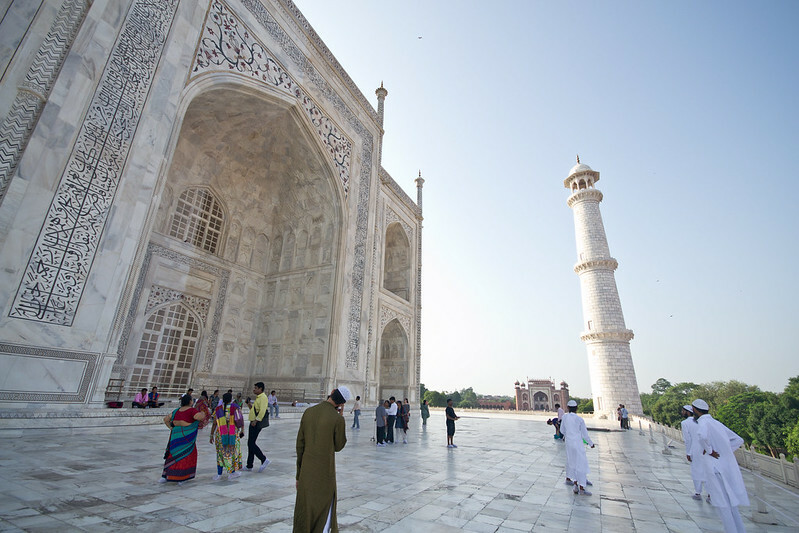 Luckily, I was able to carve out a handful of days to head up to New Delhi and Agra. While it was amazing to experience some of the things in New Delhi like this stepwell and the Lodi Gardens, the raison d’etre of being up north was to visit the Taj Mahal. I didn’t think I would even see the Taj Mahal in my lifetime. To be honest, the idea of visiting India terrified me so it was never a priority for me to make plans to go. So when all the pieces starting coming together and a visit to see the Taj Mahal became a reality, I was so incredibly excited. 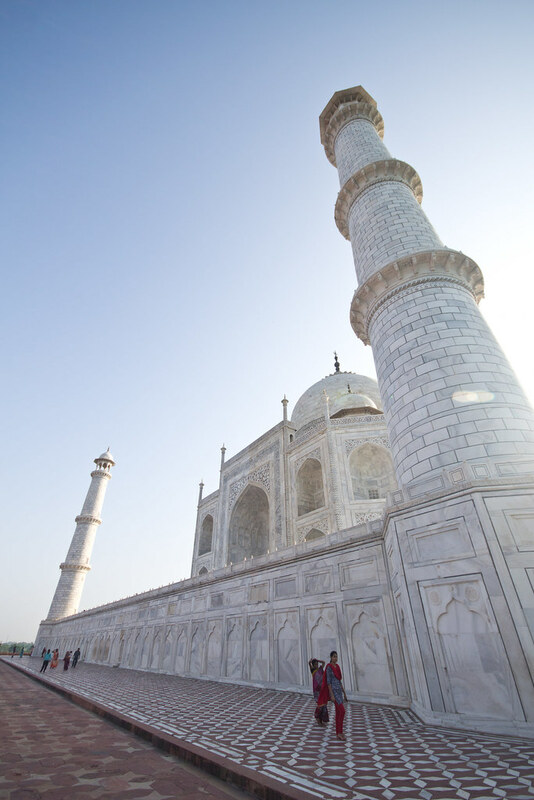 The Taj Mahal opens with the sunrise and we aimed to get there early to beat the crowds and the heat. Despite the early hour, we still encountered crowds and the heat, just not as badly as if we visited later in the day. The Taj Mahal is a mausoleum commissioned by the Mughal emperor Shah Jahan to house the tomb of his favourite wife. It was completed in 1648 and is considered one of the best examples of Mughal architecture combining elements from Persian, Indian and Islamic architectural styles. 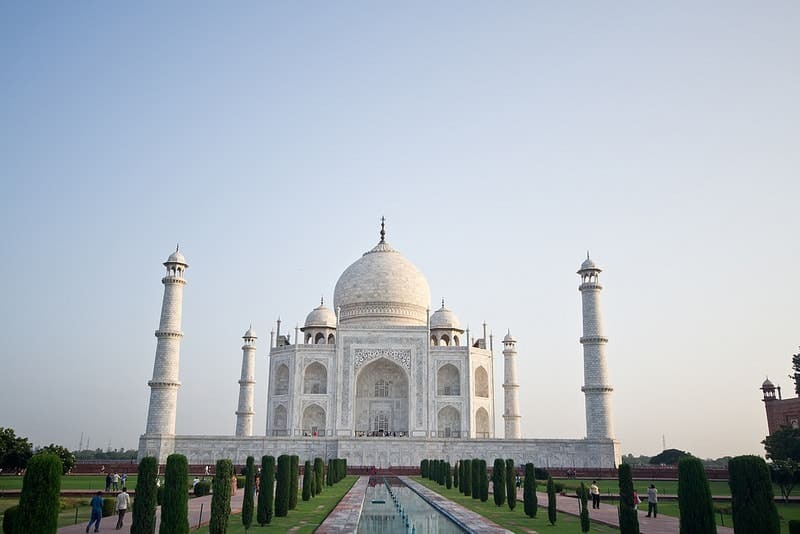 The Taj Mahal is built using materials from all across India and Asia. 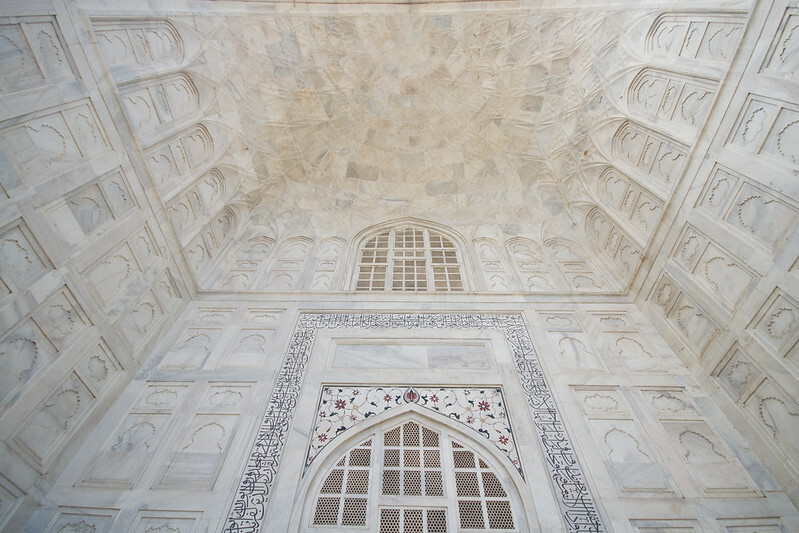 The translucent marble that is the dominant feature of the building came from Makrana, Rajasthan. 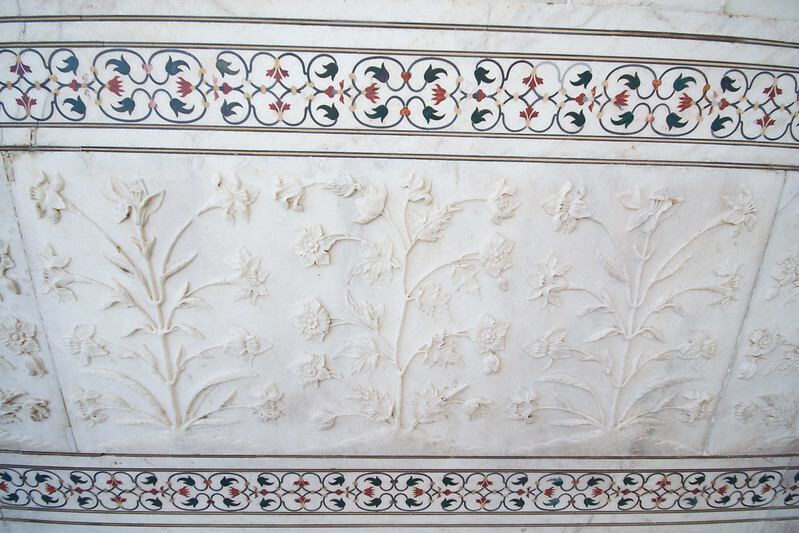 The calligraphy is jasper, or black marble, hailing from Punjab. A total of 28 types of precious and semi-precious stones are inlaid into the marble coming from as far as China, Tibet and Afghanistan. In 1983, the Taj Mahal was designated a UNESCO World Heritage Site for being “the jewel of Muslim art in India and one of the universally admired masterpieces of the world’s heritage.” It is listed as one of the New 7 Wonders of the World. Look at how intricate it is! It is believed that the gardens is that of Paradise and is separated by water into 4 quadrants to represent the four rivers of Paradise. 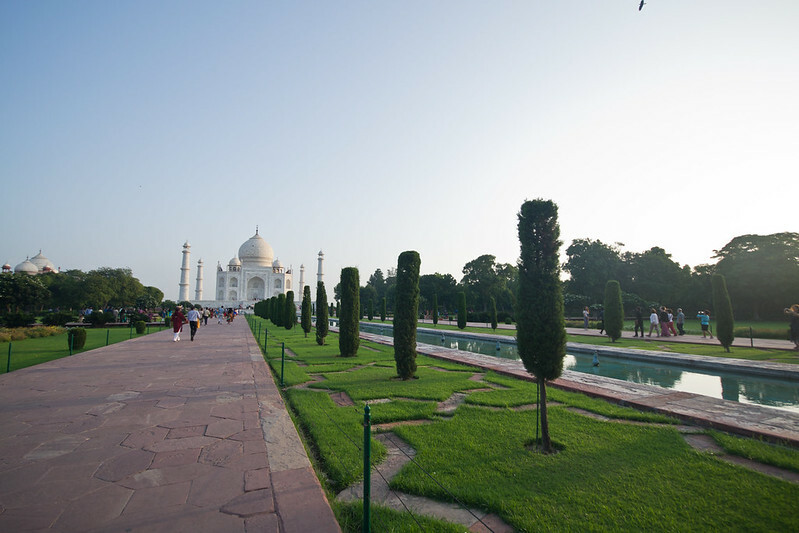 The gardens of the Taj Mahal are unusual in that the mausoleum is at the end of the garden. 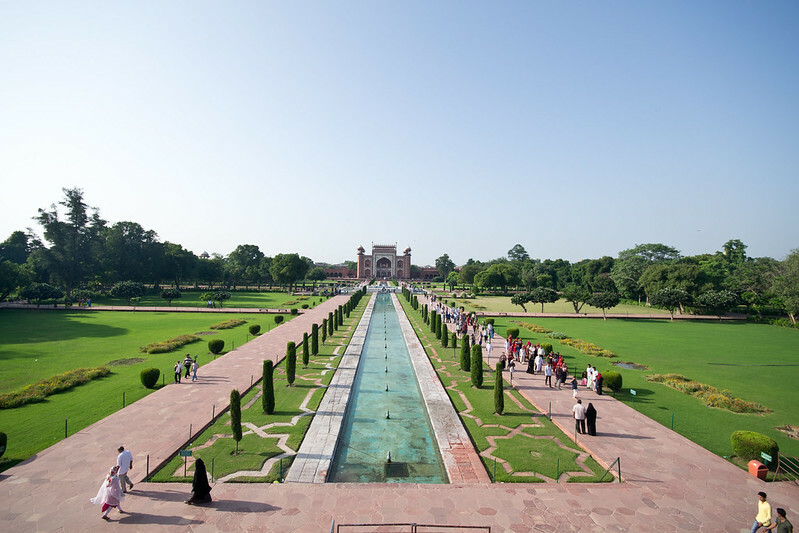 Most Mughal gardens have the main building at the centre of the gardens where the 4 rivers would meet. Today these water features make for great photos as they reflect the gardens and the Taj Mahal behind it. To get up close to the Taj Mahal, you have to put on some protective booties. You can also enter the building to see the tomb inside. Most of the building is empty and is a series of hallways. If you were coming to the Taj Mahal to see the inside, you’d be sorely disappointed, so don’t expect much. It really is all about the exterior. While the mausoleum is the focal point, also within the complex are a mosque and a guest house. 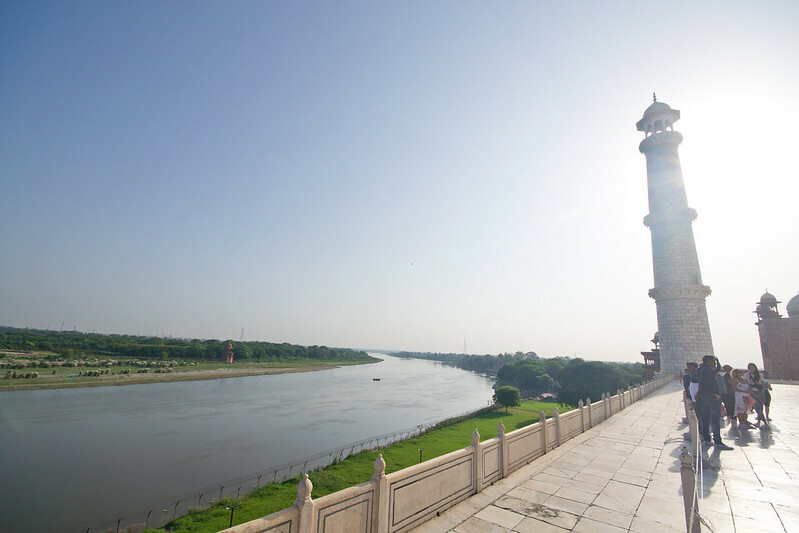 Running behind the Taj Mahal is the Yamuna river. There is also a viewpoint of the Taj Mahal from the other side of the river. Some of my friends told me that it wouldn’t be worth the trip – that the Taj Mahal is overrated and overrun with tourists. But to be honest, what major tourist attraction isn’t filled with tourists? That’s what they’re there for and I’m totally okay with that! And while I’ve been underwhelmed by some major sites (like the Leaning Tower of Pisa), at least I still have gone to see them myself! Others who have visited warned me about the contrast between the complex and its surroundings making them feel uncomfortable. I thought this was odd before the visit, but afterwards, I could kind of understand. 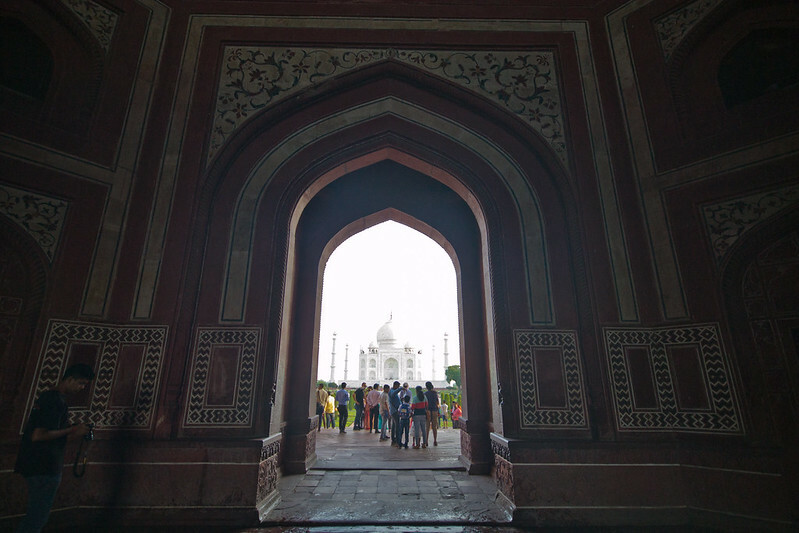 The Taj Mahal and surrounding grounds are impeccable and incredibly well maintained, but just outside the gates, you return to the rest of India with its crumbling sidewalks and buildings, organized chaos and litter. The juxtaposition wasn’t lost on me and it definitely was strange to see that. However, the same can be said about most of the other spots that I visited in India: Lodi Gardens, the Agra Fort, Gandhi’s memorial and the Prem Mandir temple to name a few. Despite the warnings, I was so completely blown away from the Taj Mahal. It’s so much more than I could have ever imagine from pictures. It’s bigger. It’s whiter. It’s more intricate. And when set against the pale blue morning sky, it looked like a painting. It really has to be seen in real life to appreciate it. I’m so glad I decided to make the effort to fly up north and drive out to see the Taj Mahal. It really was just incredible and one of the more memorable experiences during my time in India. Sure, getting up early sucked, but it was so worth it. 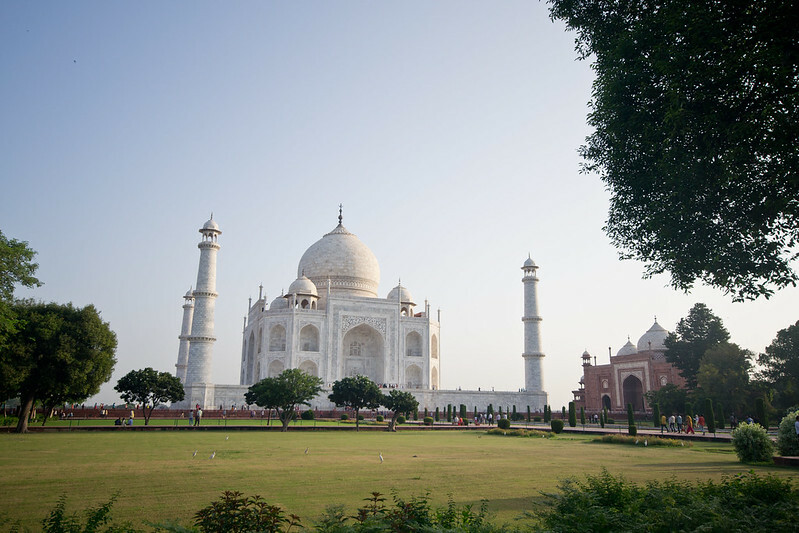 The Indian tourism agency markets themselves as Incredible India and after seeing the Taj Mahal, it really does make that ring true. I stayed at the Radisson Blu Hotel which is just a short walk away from the ticketing booth for the Eastern Gate. The room was extremely comfortable and came with breakfast. It’s also really reasonably priced especially for a Radisson which can get quite expensive in North America. Book your stay on Booking.com or Hotels.com and check out reviews on Tripadvisor. Have you been to the Taj Mahal? What did you think? Have you been impressed or disappointed by any major tourist destinations? Wow, amazing photos and what a great article. After seeing the capitol of Rhode Island, which has the fourth largest unsupported dome, we have wanted to see the big two, the Taj Mahal and St Peter’s Basilica. Thanks for letting me take a mini trip to the Taj Mahal with you. Thanks Chris. I hope you make it over there to see it for yourself! That’s exactly how I felt about going to Inda. Everywhere else just seemed a little more interesting. You should go when your friend is there so you can experience a different side to the country too. And so true about the Mona Lisa! Friends often warn me against big tourist attractions too but I completely agree that you have to visit anyway just to experience it. It may not be somewhere I’ll visit over and over but i could never miss it out altogether. Im glad to have finally read a bit more about the Taj Mahal too because it’s one of those places you see in a photo and say to yourself you’ll go some day, enjoyed seeing photos from a different angle. Yes so true! Definitely something you don’t want to miss out on and its good to see for yourself. Really incredible! Never been to India, but sure wish to visit soon. 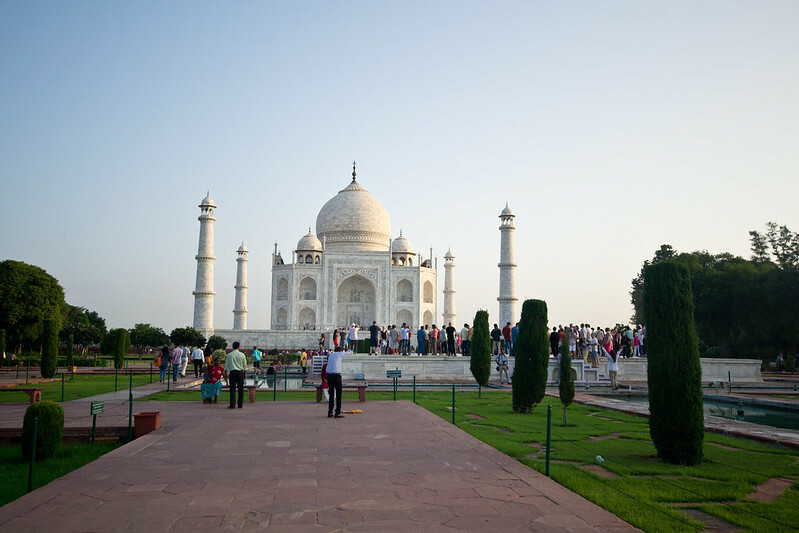 Incredible Taj Mahal is on my bucketlist. May I ask when did you visit? When best to visit and take stunning photos? Thanks! I went first thing in the morning. The grounds open at sunrise. I got there around 7 in the morning. The Taj Mahal looks incredible; it’s definitely a place I’d like to see for myself one day. I’d always assumed the inside was really ornate and elaborately decorated. Thanks for the tip that the outside it the thing to see. The Taj Mahal is definitely a huge bucket list item for me! I need to visit this wonder! It seems you had a great experience despite the tourists. I feel the same way about tourist attractions. Like, usually it’s an attraction for a reason and that means crowds…you just have to take it in stride and appreciate it for what it is. Thanks for sharing your experience! As usual, you have managed to put this amazing experience into words! Love this article! My time at Taj Mahal was like a dream – it was beautiful and majestic, it was incredible and at the same time very emotional. There is the contrast you are describing. Yes, it is very touristy, but as you have mentioned, it is normal. I have never imagined, I would have been able to see it with my eyes, however it is an experience I will cherish forever and I am so glad I did it! It is totally worth to go! Congrats on making your dream happen of seeing the Taj Mahal! It’s one of those buildings I hope to see in my lifetime – for the architecture, yes, but also for the love story and history behind it. Definitely one of the masterpieces of India! I’m glad you addressed the point of being underwhelmed – because that is a fear I have. I’m not great with crowds anymore, so would definitely get there early (can’t believe there were still so many people at 7am! ), but I agree that it’s a place I have to see myself. I’ve heard a lot about the juxtaposition too of the Taj and then the surrounding regions. I think that might be a bit of a culture shock, but the experience is at least real. The Taj Mahal is just so iconic and beautiful. I can only imagine how mesmerising it would be in person! I can’t believe how busy it was when you were there at 7.30! I would hate to think of the crowds in the middle of the day. How amusing that you have to put on booties! It makes sense, as the palace is so amazing, but I’m sure it would be funny to do when you are there. I would find the disparity between the opulent Taj Mahal and the developing streets just outside a bit uncomfortable. I would hope that some of the tourist money goes into the development of the poorer areas. Your photos are amazing, and you’ve really captured the beauty and intricacies of the Taj Mahal. I’m so glad it worked out for you! I was really hopeful that it wouldn’t be so busy but I guess when you’re in one of the most populous countries in the world, it’s hard to escape everyone! While I agree some touristic things can be over rated I would go out of my way as well to see the Taj Mahal. To see the grandeur in person and to appreciate the little details seems worth it. Also I love you posted some photos of the details, I only ever see the big picture and that little stuff is so fascinating to me! The detailing was amazing! I wish I could have captured the calligraphy on it better. Wow, that is way more people than I was expecting at 7:30 am. I didn’t realize Shah Jahan used materials from all over Asia. It is kind of disappointing that there is little on the inside but as a grand statement of love, I get it. You want to show off the love and let everyone know it. So keeping the focus on the outside makes sense. 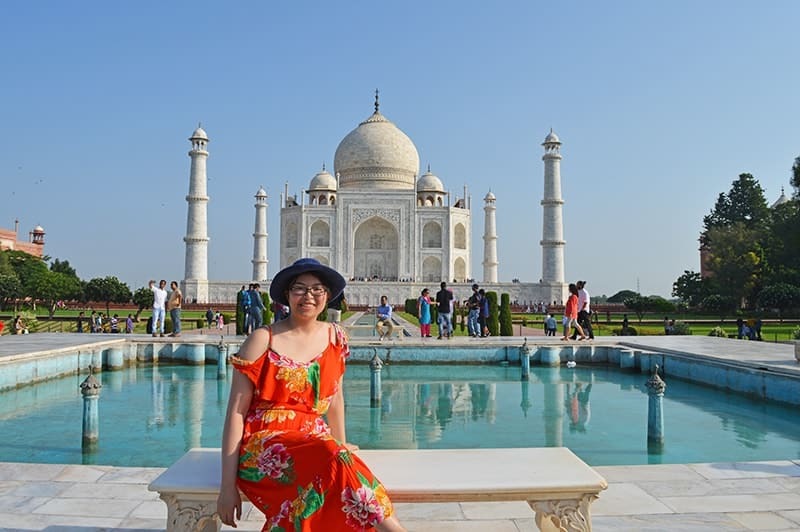 Visiting the Taj Mahal is a unique experience, Adelina! Its architecture is remarkable and outstanding! Any tips for avoiding the crowds?